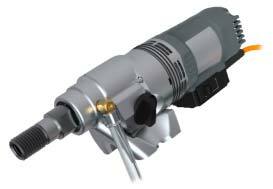 We are bracketed with renowned Manufacturers, Exporters and Suppliers of Diamond Core Drill Motor (BBM220) in Germany. Made in accordance with international quality management system, our Diamond Core Drill Motor (BBM220) is safe, use-friendly, low maintenance and high performance. Buyers can obtain Diamond Core Drill Motor (BBM220) from us at competitive prices and expect on time delivery of consignments.